TransVagrant @ Warschaw Gallery are pleased to present Flowmaster III, recent works by Merwin Belin, Troy Cherney, and Dave Smith. The exhibition will open with an Artists' Reception Saturday, March 2, from 4 - 7 PM. Working in an offbeat, politically and socially charged manner, and exhibiting as an ensemble for the third time, each approaches their subjects with an inherent irony. They re-contextualize, invert and subvert select targets with an unaffected approach to art making. Merwin Belin is an iconoclast and ironist possessing a unique take on popular and political culture. 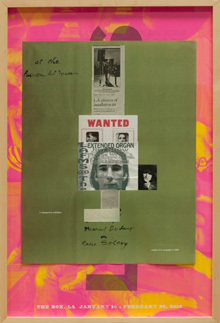 His spare, and often elegant collages reveal an acerbic wit. Troy Cherney adeptly manipulates photographs in a manner both subtle and political. Displacement and estrangement in both point of view and juxtaposition prompt the viewer to reconsider the familiar. Dave Smith's paintings, dispassionate and near anonymous in their rendering, create an emotional distance between viewer and viewed; grounds function as subtext for the re-presentation of kitsch in a vivid exploration of the banal. Organized by Ron Linden, Flowmaster III runs through April 27. For visuals or additional information please call 310-600-4873. Gallery hours are Monday - Saturday, 11 AM - 6 PM, and by appointment. This exhibition is made possible in part through generous support from the San Pedro Art, Culture and Entertainment District and the San Pedro Chamber of Commerce.